Color Memory by game developer Innoid gives players a chance to test out their memorization skills as they try to beat the clock and find all of the color matches as fast as possible. It's a quick game that's easy to learn, simple to play, but difficult to master. The developer has also kindly taken the extra step to make sure this game is playable by people who may be color blind as the tiles each have a subtle symbol on them in addition to the bright color. 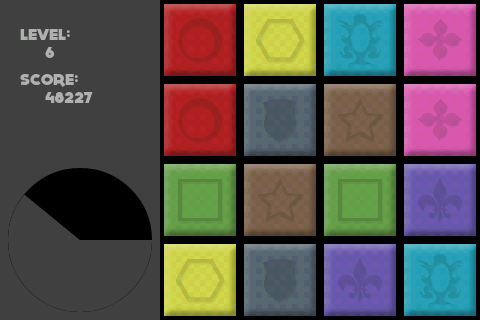 We're also proud to mention that this Color Memory Android Game includes global leaderboards that are powered by Swarm. This enables players to compete with one another across the globe to see who reigns supreme! Think you're fast? Think you have a good memory? Think again! What are you waiting for? Head over to the Google Play Store and get your daily dose of Color Memory. Best of all, it's an absolutely free title!